!! 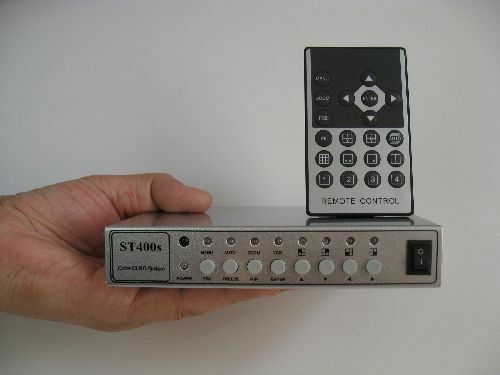 !SMALLEST LIGHT WEIGHT PORTABLE COLOR 4-CHANNEL REAL TIME MULTIPLEXER QUAD PROCESSOR - BRAND NEW!!! This 4 channel Color Multiplexer Processor enables the connection of up to four cameras to the same TV/monitor screen and display the real-time images one a monitor screen split into 4 simultaneously. It has built-in switcher which can display the pictures one by one, and also allows the operator to switch between cameras. It is the best choice if you look for a SMALL(palm size), LIGHT WEIGHT and LOW COST professional surveillance monitoring system. CONTACT US if you want to set up a professional wireless in-house surveillance system, we can also offer you our 4-Channel wireless transmitter/receiver sets and surveillance cameras at discount! Notes:Notes: The processor does not come with a power cord because most people use the processor with other systems (such as cameras) and therefore use their own shared power cord. If you need a power cord for the processor itself, you can get it from us (look at Part and Accessories tab) at a discounted price $9.99. You can also get extra Female Jack BNC Male Adaptor Connector (see the picture below) at $0.99 each. Dimension 5.6" x 3.9" x 1.0"